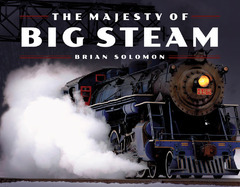 In the United States, the final decades of steam power were characterized by very large and capable locomotives. Beginning in the 1920s with Alco's three-cylinder types and Lima's "Super Power" concept, steam locomotive design crossed new thresholds of power and efficiency. A host of new wheel arrangements combined with innovative technology and new materials to create a final generation of refinement. Lima's Berkshire of 1925 demonstrated the value of the four-wheel radial trailing truck in its ability to support a firebox large enough to supply high power and fast running. Within a few years the 2-10-4 Texas, 4-6-4 Hudson, and 4-8-4 Northern had led the way, and by the late 1920s, large modern articulated types were taking shape. The Majesty of Big Steam is full of these late-era locomotives, the last generation of steam power before the diesels took over. Dramatic photos show Berkshires, Hudsons, and Northerns at work, as well as massive articulateds at their finest. Witness New York Central's Great Steel Fleet being whisked along behind some of the most refined American-designed engines. See Southern Pacific's cab-forward oil burners crest the California Sierra, and Baltimore & Ohio's EM-1 war babies lift tonnage over the Appalachian mountains. Norfolk & Western continued to refine 4-8-4s and articulated types, even as the rest of America was buying diesels, and ran these well-oiled machines longer than any other line. Don't miss a single one!